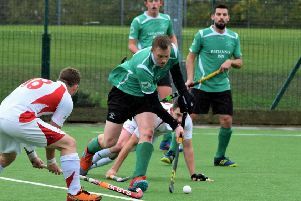 Chesterfield Hockey Club coach Christian Battye says he is delighted with his side’s form this season. Chesterfield came away with a vital win at Bloxwich on Saturday to leave them well placed in second going into the winter break. Despite a stubborn resistance from a well drilled home side, goals from Jaedyn Eade and Adam Bointon were enough for Chesterfield to record their seventh win of the season. And Battye was quick to priase the work-rate and togetherness of his side. “I’m really pleased with how things have gone so far. We have possibly the youngest side in the division and are one of the hardest working teams I’ve ever seen - let alone played in or coached,” he said. “We lost some key players over the summer but the lads that have come in have stepped up. “Even when games have got tough everyone has pulled together. We’ve still got players to come back from injury plus our big singing from Australia arrives in the New Year. “As long as we keep focused things are looking very positive”. Going into the fixture Chesterfield were still without Ben Curley (foot) and Joe Morton (ankle) but showed their resilience to overcome a side that had not lost in their five previous games. A confident start from the visitors saw them create several chances only to find the Bloxwich ‘keeper in fine form. 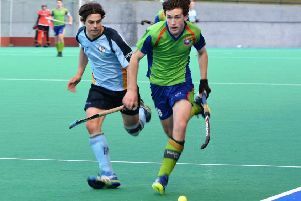 The deadlock was eventually broken from a penalty corner when New Zealander Jaedyn Eade fired into the net from the top of the circle. On the occasions Bloxwich did threaten Will Murphy in the Chesterfield goal was more than up to the task, with full backs Jon Moores and skipper Josh Brocklehurst providing excellent cover to ensure the Derbyshire side went into half time 1-0 up. A lively second period saw Bloxwich press in search of an equaliser but this left them vulnerable to Chesterfield’s fast counter attacking play. The second goal came midway through the half when Adam Bointon brilliantly finished off a flowing team move that started from the back four. The home side then threw everything they had at the game and finally pulled a goal back from one of numerous penalty corners they were awarded. There is a toughness to this Chesterfield side however and they held out for a 2-1 win to complete the first half of their league season with just one defeat from ten games.